Indie Retro News: WinUAE 3.4.1 Beta 1 - The best Amiga emulator gets a big changelog update! WinUAE 3.4.1 Beta 1 - The best Amiga emulator gets a big changelog update! The latest Amiga news to begin the week, as Toni Wilen has once again announced a new Amiga emulator beta as ' WinUAE 3.4.1 Beta 1', which has a ton of fixes and improvements over from WinUAE 3.4.0 released at the end of last year as a Christmas special. This new version which is sure to be updated throughout the year, has a big list of changes such as fixed crash when sound card audio play, implemented accurate 68020+ T0 trace mode emulation and even quickstart Blizzard modes. But as ever please see the changelog for further details. - Quickstart Blizzard modes (except if JIT enabled) enabled 24-bit addressing which caused new autoconfig/fallback mode support to think Blizzard is in 68020 fallback mode, disabling autoconfig. - Added Apollo 1240/1260 SCSI module installed on/off option. - IDE Identify drive command didn't reset multiple sector offset value. If previous read was partial multiple transfer, identity drive returned previously read data block. - Added Lock drive option to real harddrive mount dialog. If checked, all partitions in selected drive will be locked and unmounted when emulation is running, enabling full read/write access even if drive has Windows mounted FAT partition(s). Lock will be ignored if drive has one or more NTFS partitions. - Add harddrive didn't accept magneto-optical devices. - Softfloat FPU mode added to GUI, supports on the fly switching. - Untrap middle mouse button option was stuck. - Fixed crash when sound card audio play started and mono sound channel mode and "Include CD and FMV audio" was ticked. - 271b3 "Blitter final D write don't increase "nasty" count" That is not true, I think this was only added to fix demo that randomly glitches on real hardware too.. Fixes intro Himalaya by Avalanche. - Added illegal instruction at the end of each memory bank allocation, just outside of last available byte to force exception if execution falls of the edge of memory. This can happen if "more compatible" is not checked. Currently this causes bus error exception. May become halt in the future. - Emulated sprite special case when DMA mode sprite's start X-coordinate is less than sprite's DMA slot position. - HAM mode and BPLCON4 BPLAM bit changes or HAM mode and BPLCON4 sprite bank bit changes and sprites in same scanline may have caused wrong sprite or HAM colors. - >2M chip RAM didn't work in non-JIT compatible modes. - Added -ldlog 1/2 command line parameter, logs all laserdisc commands. - Recursive mode ROM scanner now skips directories starting with dot. - HDF creator used old style dialog type. - 68030 CE/prefetch mode cache access fix. - JIT direct broke 512k and 1M chip RAM size detection. - If statefile is loaded with one or more floppy images that can't be opened: keep fake disk in drive (like previously) and ask for new disk path when missing disk is accessed for the first time. (access = read or write attempt) Old disk path is shown in disk dialog title bar. - SCSI emulation SCSI buffer re-sizing didn't handle READ(6) zero size length correctly. - Added memory cycle-exact Quickstart step for A1200 and CD32 configurations. 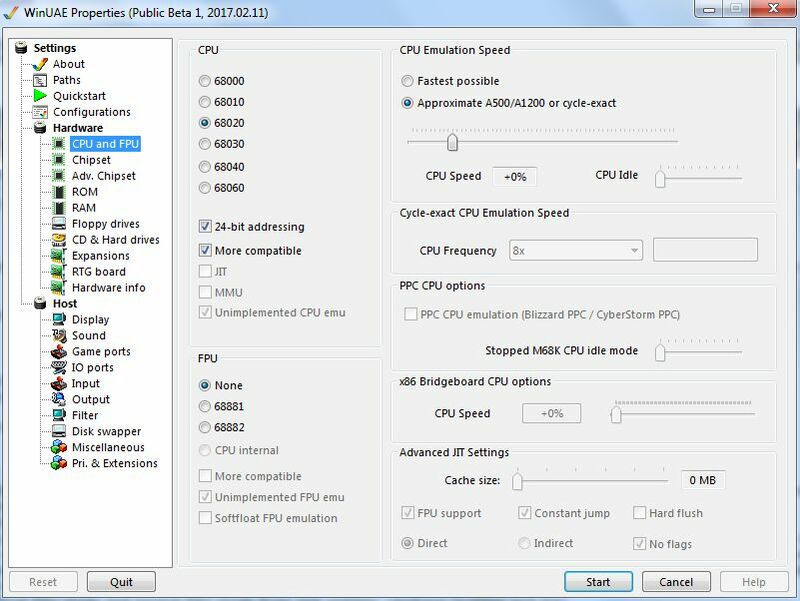 Less CPU heavy than full cycle-exact and usually not much more worse (or better). At least not until 68020 CE gets better. - Memory cycle exact mode incorrectly counted internal CPU cycles partially. - Memory cycle exact mode also enables more accurate custom chipset mode. - 68020 CE mode adjustments, fixed Chip RAM access speed (was too fast previously), removed all extra cycle counting temporarily. Work in progress. - Include key scancode in Input panel key events. Softfloat FPU mode is now officially supported, Andreas Grabher (Previous) implemented required 6888x-specific features to softfloat support library. Only needed if "weird" features are required (denormals and unnormals, invalid operands) or extended precision (that WinUAE does not support due to MSVC not supporting it) or accurate status register flags or 100% accurate rounding/NaN handling, FMOD/FREM quotient etc. Arithmetic exceptions are not yet supported. Trigonometric and logarithmic functions are currently implemented using normal native C-library functions and won't return 100% same results as real 6888x. Not compatible with JIT FPU emulation.